Successes in the Fight Against Bureaucracy? Williams, a warehouse keeper in a brewery, is holding his labour record in his hand. He boasts it triumphantly as it took him five agonizing months before he finally got what he wanted – five months of paying regular visits to the Human Resources department of the company, leaving empty-handed. Williams says that once on a nightshift he fell asleep for a while and when he woke up at dawn, one of the doors of the warehouse had a broken seal and some goods were missing. He was arrested and imprisoned for 20 days, after which he was released for lack of proofs of his guilt. Adriana Arce is a young woman who also has a long history with paperwork and documents. She’s been trying to acquire ownership of her house for five years. Another one who reflected on the issue was Carlota Menéndez, food analyst at a scientific centre, resident of the Siboney district of the Playa municipality. 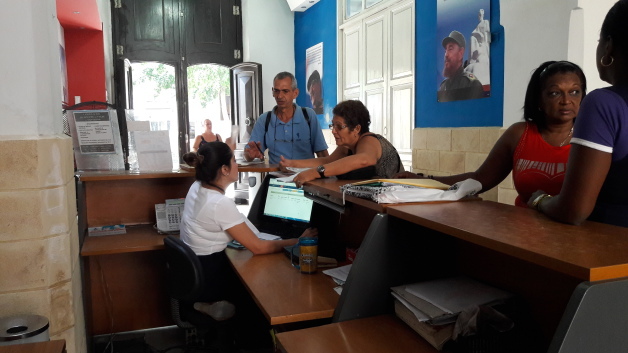 Carlota tells us that recently when she had to go through some paperwork at the Food Distribution Control Office (OFICODA), she was shocked at the amount of papers and stamps that she was asked to provide. Silvia Figueredo, who had to retire from her job in the commerce sector due to an illness, believes that bureaucracy will kill her faster than her ailments. 36-years-old Abilio, an entrepreneur born Marianao, has tried out several trades and swears that he could now give a masterclass in bureaucracy.